Uber on Monday revealed several new features for its core iPhone app —including live location sharing with drivers —as well as an agreement with Volvo that will see it buy and equip 24,000 vehicles with self-driving systems. The app's live location option can be toggled by tapping a round button in the lower-right corner of the map. When on, a rider's actual position is broadcast to an incoming driver, instead of just the original pickup point. 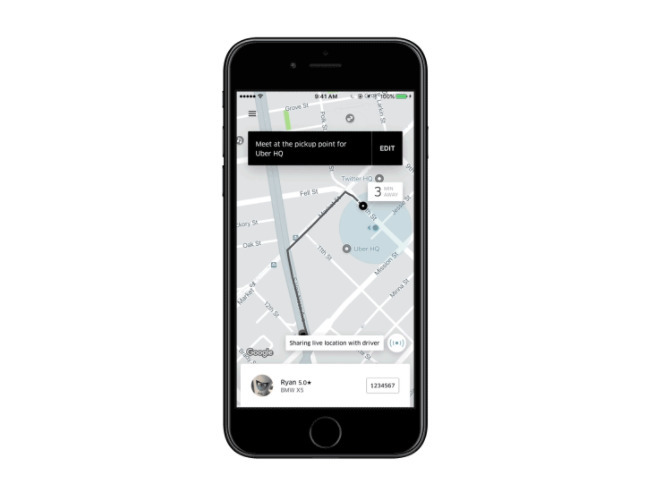 Uber has additionally expanded its Beacon support to Chicago, New York City, and San Francisco. Beacons are mounted in drivers' windshields, and glow a rider-selected color to make it easier to pair up. That color in turn takes over a rider's screen, allowing them to flash their phone to get attention. The app now also includes gifting options, and the ability to order a ride for a guest even if they don't have a smartphone. After selecting a different rider, that person will will get an SMS message with details like ETA and their driver's contact information. The Volvo deal will see Uber buy XC90 SUVs in a period stretching from 2019 to 2021, according to Bloomberg. Uber will outfit the vehicles with its own sensors and software. Volvo's engineers have reportedly been working closely with Uber on a "base" driveless vehicle that the latter company can add on to. In exchange, though, Volvo will be able to use the same platform for its own commercial self-driving cars, due in 2021. Uber has been testing autonomous vehicles in some markets, with the eventual goal of completely replacing its human driver pool. The company hasn't set a definite timeframe for when it will exit testing.